To my readers whose been following this blog since its inception in January, some of you may have realized by now that aside from being the person behind jlofied and KidiKraft, I am also a government employee. You see, it has always been my advocacy to inspire people to create a second income without leaving their profession or without quitting their regular day job. To do this, you should be able to get a business that you must really be interested in and something that is low maintenance. A business that you can just do online after your day job or something that you can do over the weekends. You can be a Blogger, Virtual Assistant, Event Planner, Online Seller, Stylist, Writer, Musician, Photographer, Graphic Artist, Singer, and the list goes on. In the past 6 months, close to 200 people were added on my FB friends list and most of them are freelancers. Every business comes with a great responsibility, and paying taxes is one of them. Recently, the Bureau of Internal Revenue (BIR) launched their campaign entitled "Easy as RFP" with this "nakaka - LSS" upbeat song. RFP stands for Register, File and Pay and I really do hope that the process is really as easy as watching this video because I will be registering as "mixed income earner" within the year. 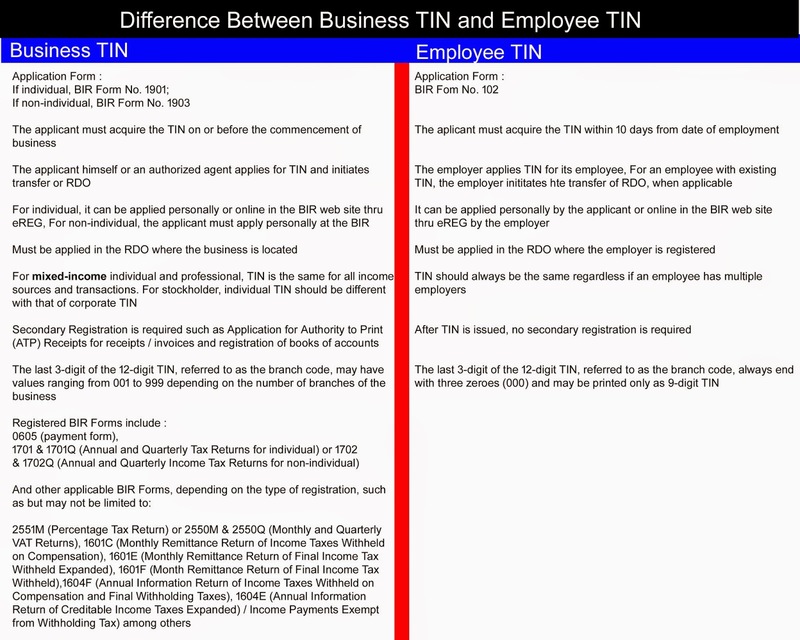 Another information that I would like to share is the difference between a Business TIN and Employee TIN. Please check out the graphic below to assist you before filing for a TIN. We are all aware of the flaws of the government and I will totally understand if you have "sentimyento" with the government. However, I am encouraging you to do our share in helping the economy.